Recently, I was able to interview Henry Gayden, the screenwriter and creator of the concept for Relativity's Earth to Echo, which opens in theaters on July 2. He shared with me the story of his childhood fear of aliens. Alejandro Rojas: I find that writers sometimes give more insight into the heart of what their movies are about when they describe it. How would you explain what Earth to Echo is about? Henry Gayden: It is about a bunch of kids who receive a message on their phone. In fact, a whole neighborhood does, but no one really pays it much mind but them. They soon discover that it is some kind of cryptic map that wants them to go out far away from people. So, after their parents turn them down and don't listen to them, they decide to take matters into their own hands, and behind their parent's backs. They follow the map, and what they find is far beyond their craziest imaginings, and some of them are pretty crazy. It is something that needs their help and takes them on an adventure that takes much longer than they thought it was going to take, and it ultimately changes the course of their lives. Rojas: I hear that you are interested in the topic of aliens and UFOs. Is that true? Gayden: Yeah, that is true. I was kind of unwittingly scarred, lovingly so, by my mom as a young kid. When I was like seven years old, she told me that she saw a UFO when she was younger. She told me this very detailed story. She was out in a cabin in the woods, and she was with my aunt. I think my dad was there too, but he was asleep. She was outside with my aunt, and they saw this sort of disc, or light, in the air. It sort of flew through the air and stopped in the middle of the night sky, just stopped in midair. And, from inside of it a smaller UFO flew out in one direction, and the larger one flew off in another direction. After that, I spent a good part of age seven to twelve or thirteen in grave fear of the aliens. So much so that I was on a track and cross country team as a young boy, and every time I went running at night I was looking up at the sky to see if I was going to be abducted. Every movie about that stuff scared me. I had a little window, and I always tried to keep it shut. It would never shut, and I always thought there would be aliens out there. I was mostly scared, and then two things happened. First, when I was twelve, my mom found out, and she said "Look if they wanted to destroy the Earth, or you, they would have done it already, so relax." Second, my mom subsequently passed on, and I met my aunt for the first time a couple of years ago. I said, "Hey! I need to ask you about this story." I told my aunt the story, and she smiled and said, "You know, we did a lot of drugs that night." So, I definitely lean towards believing it. I think 99% of the stories we hear out there are probably just noise, but I am definitely of the mindset that it is possible. I even took a SETI class in college. It is an interesting subject matter to me. Rojas: What do you think is unique about this movie? Gayden: Honestly, the one thing I will say that makes it stand apart for us and why we love the story, is that in making the film we took a lot of courage from Stand by Me. We didn't want to make a movie that's about an alien. We wanted to make a movie that featured an alien, but was about the kids. So, when you see the movie you will see that really it's about what is going on in the kids' lives. 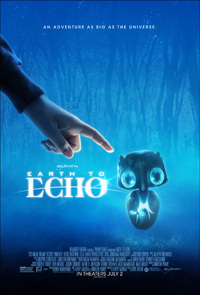 Initially, when we were putting the movie together, Echo (the alien) was a smaller unseen part of it. Then, when we saw Echo and saw the kids interacting with it, we thought it was great. We have got to build this out. But when it comes down to it, it is really the story of these two kids and what they go through interpersonally in their lives on that night, sort of like the film, Stand by Me. So, we wanted to make a really honest movie about kids that kids could relate to. To read the rest of the interview, including more about the difficulties of making a movie for kids in Hollywood, and UFO and alien conspiracies, visit OpenMinds.tv.